I've been reviewing a fair bit of wines lately, but who's complaining?! Not this guy. It's not too often that I get to taste more than one vintage of the same wine side-by-side. Apart sure. But side-by-side? Well, today's my lucky day! 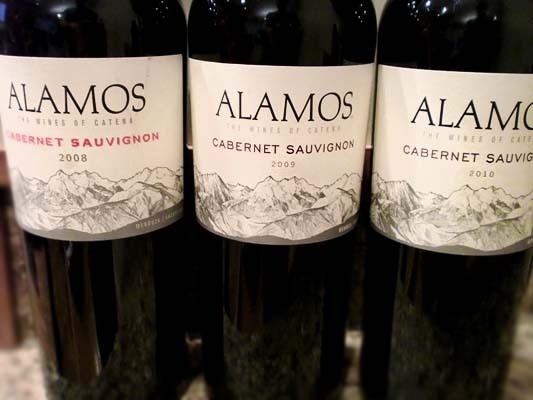 Here are three vintages of the Alamos Cabernet Sauvignon, the 2008, 2009, and 2010. Not too long ago I reviewed the Alamos Torrontes, which I enjoyed quite a bit so I was hoping their Cabernet would fair as well. Especially since these are easy wines to find just about everywhere. Enough talk. Let's taste these bad boys. All three pour approximately the same dark magenta color. The 2008 smells of cherries, currants, and vanilla, with this carrying forward into a palate of sweet, soft cherries, hints of herbs and oak. The 2009 smells and tastes a bit more vibrant with aromas of black cherry and leather followed by tastes of zesty sour cherries, raspberries, plums, a touch of tobacco and other herbs. The 2010 has aromas of black cherries and vanilla followed by tastes of raspberries, blackberries, and a bit of nondescript herbs. So to sum it all up the 2008 is far and above the sweetest and has a soft, velvety mouthfeel. The 2009 is tart, zesty, and the liveliest of the bunch. The 2010, however, is a bit too juicy and flabby ending up kind of boring. I really enjoyed the 2009, with the 2008 being a decent pour. Well, there you have it. And no, there's not a "Drink this/Don't Drink this" report for the review this time since I just don't feel like it... and it's my blog, so there!